Fiona Robertson from the Waikato will never forget May 12, 2010. Her beautiful Newfoundland dog, Rosie, was diagnosed with dilated cardiomyopathy, a terminal heart condition common to the breed. Although she didn’t realise it at the time, her love for her gentle giant of the dog world would evolve into a burgeoning business. Fiona, a qualified veterinary nurse, was not about to give up on her pet. She had read about the benefits of fish oil and decided to try and find a fish oil supplement in the hope that it would improve the quality of her dog’s life and even prolong it. But the product she was looking for – a fish oil supplement which was sustainable, ethically sourced and produced, and an NZ product – wasn’t available. So she decided to make her own. 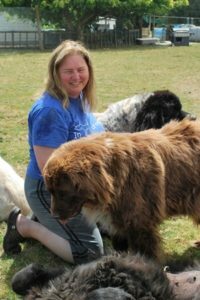 Fiona started her trials using a refined human-grade product on her Newfoundland dogs. The results were spectacular, not least on Rosie. Drawing on lessons learnt from Rosie’s trials, Fiona established her business, Newflands, which now ships animal health supplements (featuring omega-i oil and hoki oil) to a growing list of international stockists. The range has expanded to include healthy treats, which support pets’ immune systems or work with veterinary treatment if they have arthritis, itchy, flaky or scratchy skin conditions, eye issues or heart problems. They are suitable for dogs, cats and even humans. Fiona works alongside Massey University to provide scientific proof of the benefits of using fish and krill oil supplements. Other Newflands products are currently at the research and development stage, she confirms. The supplements are manufactured at factories in Auckland and beyond and returned to Fiona’s home for distribution (unless they are overseas orders). Newflands range is available at stockists in NZ, Australia, Malaysia, Singapore and from Amazon in the USA. Anyone would think running a business from a rural property wouldn’t be a problem these days, thanks to the internet and the wonders of on-line shopping and banking. But it’s not that easy if Fiona Robertson’s experience is typical of the problems facing rural entrepreneurs. An appalling internet connection and lack of courier services to her remote property might have caused her to abandon her business plans. However, like a dog with a bone, Fiona tenaciously refused to let logistical setbacks stand in her way. “Couriers will neither deliver nor collect from me so I have a 20-minute drive with all my orders. Furthermore, postal deliveries have dropped to only three times a week,” she says. Her struggles to grow a successful business in the sticks were recognised by reaching the finals of The David Awards – which recognise the unsung heroes in home and small businesses – last year. Fiona’s Newflands business impressed the judges by succeeding in spite of challenges beyond the usual. Now, thanks to faster internet, Fiona’s business is running at full speed, with Skype eliminating the need to travel to Auckland several times a week.